Be the first to share your favorite memory, photo or story of Vernon. This memorial page is dedicated for family, friends and future generations to celebrate the life of their loved one. 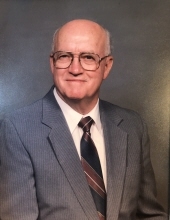 Vernon Curtis Smith, 90 years old of Knoxville, TN went home to be with the Lord Saturday, November 3, 2018, peacefully at home. He was a member of Dixie Lee Baptist Church. Vernon was a Korean War Veteran serving in the United States Army National Guard. He retired from Standard Knitting Mills in 1988 after working 42 years for them. Vernon was a loving husband, father, grandfather & great grandfather. Proceeded in death by his father and mother, Ernest & Muriel Smith and his brother Maurice Lee Smith. Survived by loving wife of 69 amazing years Mary Ruth. He leaves 2 daughters Janet (Dan) Hardin and Patricia “Patty” Carter, 5 grandchildren Patrick (Chauntelle) Hardin, Keith (Christy) Fletcher, Rachel Hardin, Kelley (Adam) Stoner and Kala (DJ) Wagoner. Four great grandchildren Jordan, Noah, Jacob and Preston, Special Nephew Kenny (Cyndi) Smith and special friend and caregiver Celia Cook. The family greatly appreciates the loving care provided by Smoky Mountain Hospice. Family will receive friends 12noon-1pm Thursday at Click Funeral Home Farragut Chapel with a funeral service to immediately follow at 1pm. Graveside service will follow at 3pm at Berry Highland Memorial Cemetery with full military honors conferred by the Volunteer State Veterans Honor Guard. To send flowers or a remembrance gift to the family of Vernon Curtis Smith, please visit our Tribute Store. "Email Address" would like to share the life celebration of Vernon Curtis Smith. Click on the "link" to go to share a favorite memory or leave a condolence message for the family.